I have to admit to being a little bit late to the whole audio book thing. I only started a few years ago when the traffic and commute to work started becoming unbearable and I needed something to take my mind off the daily grind. I THEN discovered just this year that I could download these books straight onto my phone and listen to books WHILE DOING THE HOUSEWORK. My house has never been so clean and I now clean up (semi) cheerfully while someone tells me a story. I’ve written before about my absolute love of Ilona Andrews and how much I adore the Kate Daniels series- in both the written and audio formats. Renee Raudman, the narrator of this series is so fantastic and I got real book hangover just from listening to these books. After finishing the last book in the series I went in to mourning for a day and then was like a junkie scrounging for the same kind addictive hit. I decided to go look for a Kristen Ashley book to go for something very different but also has that cracktastic quality and I’m so glad I did! Audible gave me a big discount on the price of the books since I had already purchased the Kindle version so off I went into Rock Chick land. As Shirleen would say- Oooowee! I glommed onto these audio books and listened to all 8 in one month. Yup, you heard it, all EIGHT in ONE MONTH. Susannah Jones, the narrator of the books, was very good with handling all the different characters and voices and was a younger, happier sounding narrator which fit into the whole vibe of the books perfectly. She was excellent at injecting the fun neurosis into the female characters- especially their panicked self-talk when they know they’ve gotten into trouble. I have to admit that coming off Renee Raudman’s narration and the way she did all the different voices so distinctly I sometimes felt that Susanna didn’t differentiate characters as well especially between books but that’s more about how good Renee was than any sort of lack on Susanna’s part. I again went into mourning after finishing the last book, Rock Chick Revolution but cheered myself up trying to decide who of the Hot Bunch was my favourite. 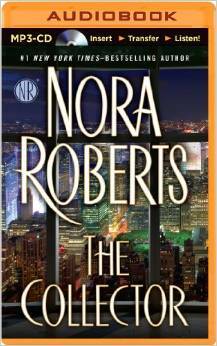 Book boyfriend fantasies aside, the next book I put into my phone was The Collector by Nora Roberts performed by Julia Whelan. Props to this reader for doing really good guys’ voices. There is nothing more distracting than a girl trying to sound like a guy and doing it badly but Julia did it so well it added to the story rather than detracting from it. I am such a fan of Nora’s work but have to admit that I when I first read it I liked this book but didn’t LOVE it the way I did say, Birthright or Angels Fall or Naked in Death. The funny thing is that I am halfway through the book now and am utterly drawn into the story in a way that I wasn’t when I read it. It’s again proof positive that you pick up things listening to a book that you may have missed reading it. So it looks like this love affair of mine with audio books although a late bloom may end up being an enduring one. I have only ever listened to books I’ve already read so am interested in seeing what happens when I listen to a book before reading it. Do you have any recommendations for audio books?